There are countless diseases, infections, and viruses that can wreak havoc on your immune system. That being said, a lot of them target your immune system in completely different ways. Some of these you’ve probably never even heard of, such as hypergammaglobulinemia. In this article, we will examine hypergammaglobulinemia. From hypergammaglobulinemia symptoms, to hypergammaglobulinemia causes, to hypergammaglobulinemia treatment, we’ll tell you everything you might want to know about this disorder of the immune system—and the different ways you may be able to treat it. Let’s get started, shall we? What is hypergammaglobulinemia? It’s certainly a hard word to spell, but what does it mean for your body and overall health? Hypergammaglobulinemia is an immune disorder that is actually a fairly rare occurrence. Essentially, it is when your immune system malfunctions and there is a deficiency in B-cells (B-lymphocytes), which leads it to increase the amount of gamma globulins (a type of antibody) in your bloodstream. Immunoglobulin M (or IgM) levels, in particular, tend to be quite high in those suffering from the condition. Normally, these B-cells can do something called class switching. The ability to class switch means that when your system is making too much of one type of antibody, it can switch it up and turn those antibodies into other ones. With hypergammaglobulinemia, this class switching cannot occur, which means one antibody (IgM) is produced more than the others. While the IgM tends to be high, the other gamma globulins, IgA, IgG, and IgE, tend to be low, but there are cases in which the IgM count is high while the other gamma globulins maintain a normal level. But this is a good thing, isn’t it? More antibodies can fight off more bad things, right? Not in this case. In this situation, the lack of antibodies and the overwhelming presence of one particular antibody can leave the body open to attack from various viruses and diseases that might have otherwise been fought off. Making matters a little worse, there are actually multiple types of hypergammaglobulinemia, and each type comes with its own unique issues and complications. There are five different types of hypergammaglobulinemia: type 1, type, 2, type 3, type 4 and type 5. These different types basically refer to the reason why the B-Cells cannot class switch and why your body is now over producing IgM. Type one refers to the fact that the B-cells and the T-cells (the cells in your body responsible for class switching) are unable to communicate, resulting in the B-cells’ inability to class switch. A mutation of AICDA gene (which is an important genetic factor in task switching), prevents the recombination of genetic material. This is necessary to allow a specific portion of a B cell to switch to another type of antibody. In this type, the T-cells are trying to transmit the message to the B-cells to switch type, but the B-cells aren’t listening. The cause of this type is still undetermined as of this writing, but this type causes the over-production of IgM while the rest of the antibodies stay at normal levels. The UNG gene sends a signal to living cells to create a specific enzyme. 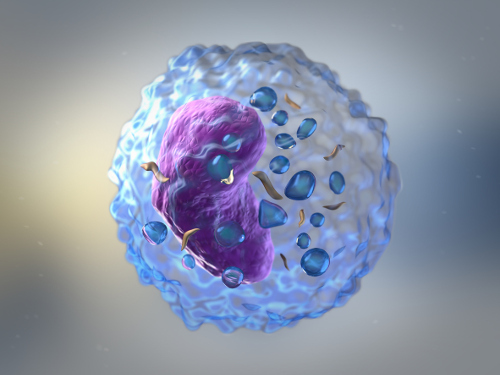 This enzyme helps with the recombination in a B-cell to allow it to switch type. In type 5, the UNG gene has a mutation that causes the enzyme to malfunction and full gene conversion does not occur. While all of this science information is useful and allows you to understand what hypergammaglobulinemia is, you may also want to know more what to look for in the hopes of identifying it. Hyperglobulinemia is nothing to play with, but how do you end up with it? What causes hyperglobulinemia? Now that you know what causes it, we can move on to tell you what you can expect when it comes to treating hyperglobulinemia. While there are many treatment options for the underlying causes of hypergammaglobulinemia, there are very few treatments for the hypergammaglobulinemia itself. The most prominent one is immunoglobulin replacement therapy. This therapy involves injections of the immunoglobulin and antibodies that you are deficient in to help spur the body back into reproducing them, as well as to help keep your body’s natural defenses to disease, viruses, and infection. It’s not an entirely pleasant experience, but it can hopefully get your body back up and running. Make no mistake: hypergammaglobulinemia can be a very dangerous condition to have. It can allow infections, viruses, and all manners of nasty things into a system that can no longer combat them well. That being said, hypergammaglobulinemia is very uncommon. So, unless you have one of the causes we pointed out, it’s not something you’ll have to be worried about. However, if you do end up with hypergammaglobulinemia, at least you will have some basic knowledge to help you in your fight against it. “Hypogammaglobulinemia,” HX Benefit, November 22, 2011, https://www.hxbenefit.com/hypogammaglobulinemia.html, last accessed June 22, 2017. Nicks J., “Hypergammaglobulinemia: Causes, Symptoms, and Treatment,” Buzzle, May 20, 2014, http://www.buzzle.com/articles/hypergammaglobulinemia-causes-symptoms-and-treatment.html, Last accessed June 22, 2017. “Types Of Hypergammaglobulinemia: Causes, Symptoms & Treatment,” Tandurust, April 12, 2016, http://www.tandurust.com/rare-diseases/hypergammaglobulinemia-types.html, Last accessed June 22, 2017.